This can be anything done to correct imperfections in the appearance of the mouth. Anyone who is unhappy with their smile can certainly considering having it fixed. Generally the upper teeth show when smiling, while the lower teeth remain less visible. This is reversed when talking, with the upper teeth remaining hidden while the lower teeth show. The color, alignment, proportion, spacing as well as regularity of the teeth are the characteristics that give the overall appearance. Any of these can be repaired to give a stunning look to the mouth. This is a procedure of making teeth whiter, and therefore more attractive. Our office recommends professionally constructed mouth trays to whiten the teeth. A gel material is placed in the trays by the patient and the trays are worn for a few hours at a time. This can be done at home, at work, shopping, reading - almost anytime. The results are dependant on many factors, but all patients who bleach see results. The process takes 3-5 weeks in the majority of patients. The length of time required depends on the patient, how often the trays are used, the initial colors and shades of the teeth being treated and several other factors. Over time, you will usualy want to "refresh" the bleach result with additional bleaching sessions. Dr. Hinson will visit with you about whether you are a good candidate for bleaching during your visit. 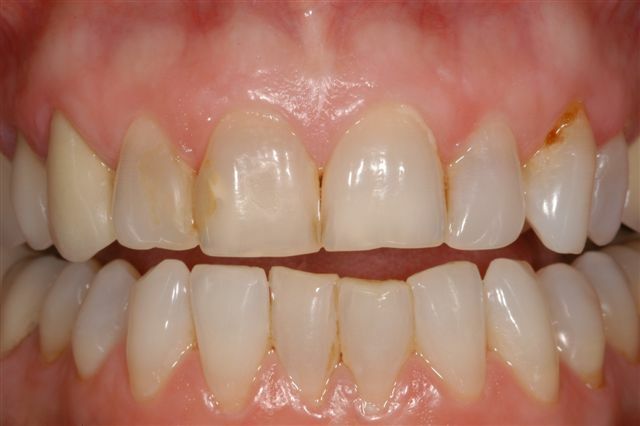 There are many different methods for tooth bleaching available to the public. Bleaching "strips" can be purchased in most pharmacies and other stores and we have seen good results in some patients. Ask Dr. Hinson if he thinks this might work for your teeth. Also, there are many "light assisted" or "laser" bleaching techniques offered by dental professionals. Most all independent research suggests that light or laser assisted bleaching is no more effective than chemical bleaching. Dr. Hinson considers "light assisted" bleaching expensive, time consuming, and ill advised for the most part. Veneers are a dental procedure in which a porcelain covering is placed over the outside (visible area) of the tooth. 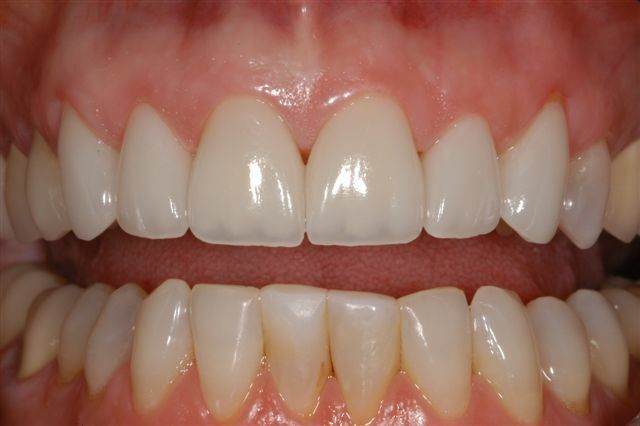 Veneers are usually only done to the parts of the teeth that are visible when talking or smiling. This usually means that the back of the tooth, or tongue side, has minimal coverage or change. The process can be completed in two ways, direct or indirect. The direct technique involves placing composite resin on the outside of the tooth using tooth shaded filling materials. This method is usually referred to as "bonding." It is a "free handed" sculpturing technique performed by Dr. Hinson. 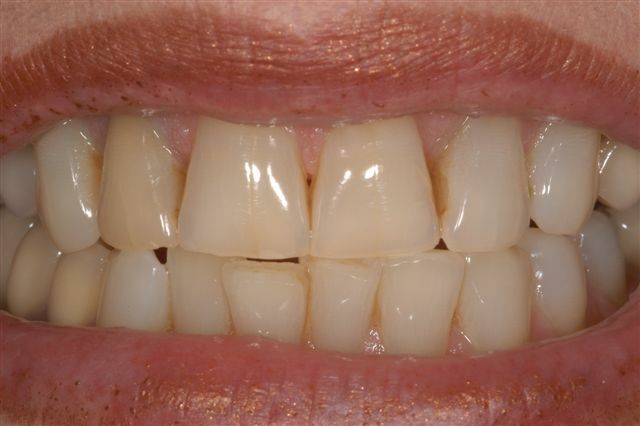 The indirect technique usually involves two appointments because the porcelain veneers will usually be fabricated at a dental laboratory. At the first appointment the teeth are prepared with a minimum amount of tooth removal required, impressions are taken, and the teeth are given a temporary covering. In a few days, the veneers are back from the laboratory, the temporaries are removed and the veneers are bonded to the teeth. The laboratory fabricated veneers are made utilizing specialized porcelain or pressed ceramics, and are extremely esthetic. Porcelain laminates are considered by many to be the most cosmetic tooth enhancement available and can transform smiles like nothing else. 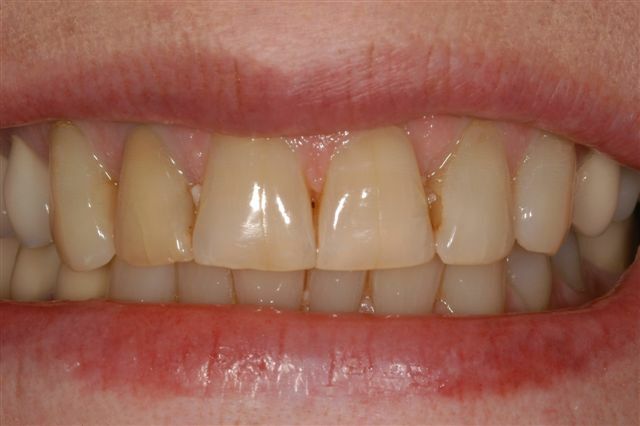 The advantage of veneers versus crowns is that generally much less tooth material is removed. Veneers are not recommended for teeth that have large fillings or little remaining natural tooth structure, as these teeth usually require more involved treatment. Essix appliances straighten your teeth with a series of clear, virtually invisible custom-molded plastic aligners. By using a series of clear removable aligners, this technique straightens your teeth with results you'll notice sooner than you think. The course of treatment involves changing aligners approximately every two weeks, moving your teeth into straighter position step by step, until you have a more beautiful smile. And unlike braces, these clear aligners can be removed while you eat and brush your teeth as usual. However, they can only be used in certain circumstances and usually for minor tooth movement only. Dr. Hinson can advise you on whether you are a candidate for this type of dentistry or if you will need a licensed orthodontist.